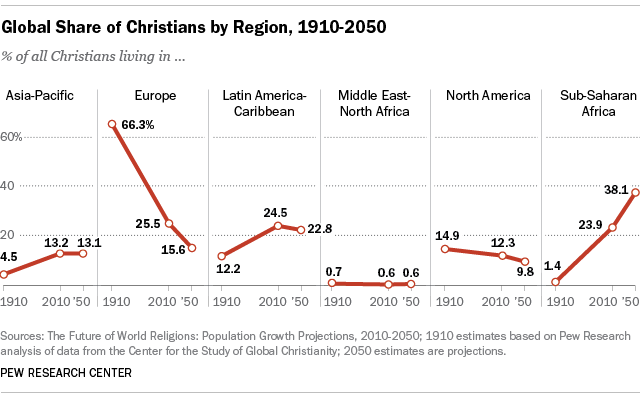 The global Christian population has been shifting southward for at least a century and is expected to continue to do so over the next four decades, according to new demographic projections from the Pew Research Center. Overall, the share of Christians in the world is expected to remain flat. But Europe’s share of the the world’s Christians will continue to decline while sub-Saharan Africa’s will increase dramatically. Nearly half of the world’s Christians already reside in Africa and the Latin America-Caribbean region. By 2050, according to the Pew Research study, those two regions will be home to more than six-in-ten of the world’s followers of Jesus, with just a quarter of Christians living in Europe and North America. This was not always the case. In 1910, for instance, Europe was home to roughly two-thirds (66%) of the world’s Christians, with North America a distant second with 15%. In 2050, nearly four-in-ten of the world’s Christians (38%) are expected to be living in sub-Saharan Africa, up from 24% in 2010 and less than 2% in 1910. In addition, by 2050, five of the 10 largest Christian populations in the world – Nigeria, the Democratic Republic of Congo, Tanzania, Ethiopia and Uganda – will be in Africa, which had three of the 10 largest Christian populations in 2010. By contrast, 35 years from now, the share of global Christians who call Europe home will have dropped to roughly 16% (from 26% in 2010). In addition, only 10% of the world’s Christians will be living in North America, down from 12% in 2010. The share of the global Christian population in Latin America and the Caribbean also is forecast to drop slightly, from about 25% to 23%. But it will be the region with the second-largest number of Christians, behind only sub-Saharan Africa. The share of Christians in the Asia-Pacific region, now about 13%, is expected be the same by 2050. But uncertainty over the data from China (which has 1.3 billion people) ultimately could change the 2050 estimate. 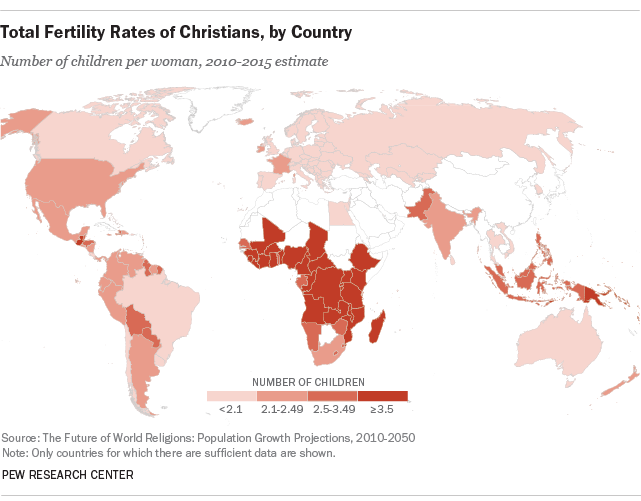 The biggest factor in determining the future global distribution of Christians is population growth, which in turn is driven by factors such as fertility rates. Sub-Saharan Africa’s overall population, which is young and tends to have more children than people in other regions, is expected to more than double between 2010 and 2050, from 823 million to 1.9 billion. At the same time, Europe’s overall population, which is older and has the lowest fertility rate of any region, is expected to shrink, from 743 million in 2010 to 696 million in 2050. Religious switching also plays a role. In Europe, the share of people who say they are Christian is expected to drop from roughly 75% in 2010 to 65% in 2050, with the number of those switching out of Christianity playing a significant role, along with immigration of members of other religious groups and other factors. Likewise, the percentage of North Americans who self-identify as Christian is expected to drop from 77% in 2010 to 66% in 2050, with similar factors at play (including some people leaving Christianity and becoming religiously unaffiliated). Despite a decrease in the share of Americans who are Christian, the U.S. is projected to remain the country with the world’s largest Christian population, with an estimated 262 million Christians in 2050.